Kamon—Japan’s family crests—originally referred to as “mondokoro” or “ie no monsho,” were motifs used to express the identity of each family in the form of an emblem. 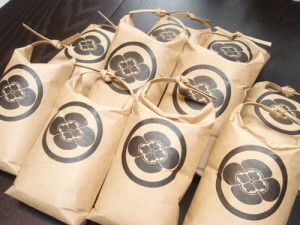 Kamon are generally thought to have originated during the period when an aristocratic culture flourished in Japan. An aristocratic hobby was to think of one’s favorite motif as a pattern, then to use this pattern to decorate things such as one’s clothes or palanquins. With repeated use, this pattern turned into an emblem associated with that particular individual or family. 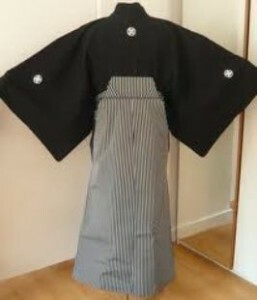 things such as their noren shop curtains, hanten coats and tenugui hand towels, thereby strengthening the meaning of kamon as a sign. 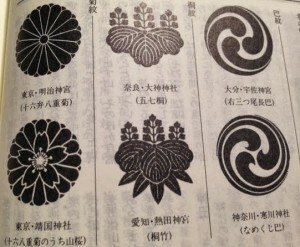 The appeal of Japanese kamon is not simply a matter of the beauty of forms. Rather, it exists in a quietly inherited refinement that took root in the lives of the Japanese people and continued to maintain a strong image as a symbol of an individual or family.